The 2014 Junos are officially on! Saturday's three-hour industry-only music gala saw 35 of 41 awards handed out, and many of the weekend’s major hopefuls, and stars, went home with hardware. 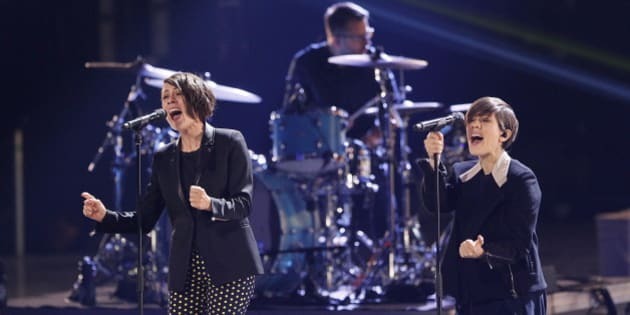 Later, it was Tegan and Sara’s 2013 pop opus “Heartthrob” which fittingly won Pop Album of the Year, beating out the respective efforts of Hedley, Michael Bublé, Robin Thicke, and Walk Off the Earth. But it was Matt Mays who threw out the night’s first f-bomb, while accepting the trophy for Rock Album of the Year – a moment he almost missed altogether, getting to the stage just minutes before host Jian Ghomeshi presented another award. This year marked the first time the general public could livestream the industry-only gala dinner, but many of the unfiltered shenanigans, drunken speeches and excellent sound bytes happened backstage. One of those moments belonged to Electronic Album of the Year winner, Ryan Hemsworth. The Halifax DJ, who won for “Guilt Trips,” is known for his mashups of everything from J-Pop to Southern rap. Speaking to the press room, Hemsworth joked about his unprejudiced musical tastes. Despite country crooner Brett Kissel's loss to Dean Brody for Country Album of the year, he grabbed the award for Breakthrough Artist of the Year. The 23-year old, who couldn’t stop gushing over his wife, Cecelia, also gave the night's most adorable acceptance speech. The full list of 2014 Juno Award gala winners is after the nominees slideshow-- the remaining six awards will be announced live, on Sunday, March 30, at 9 p.m.